Unique silk wrap [kira] with symbols from Bhutan. By far the most exclusive masterpiece in our collection! 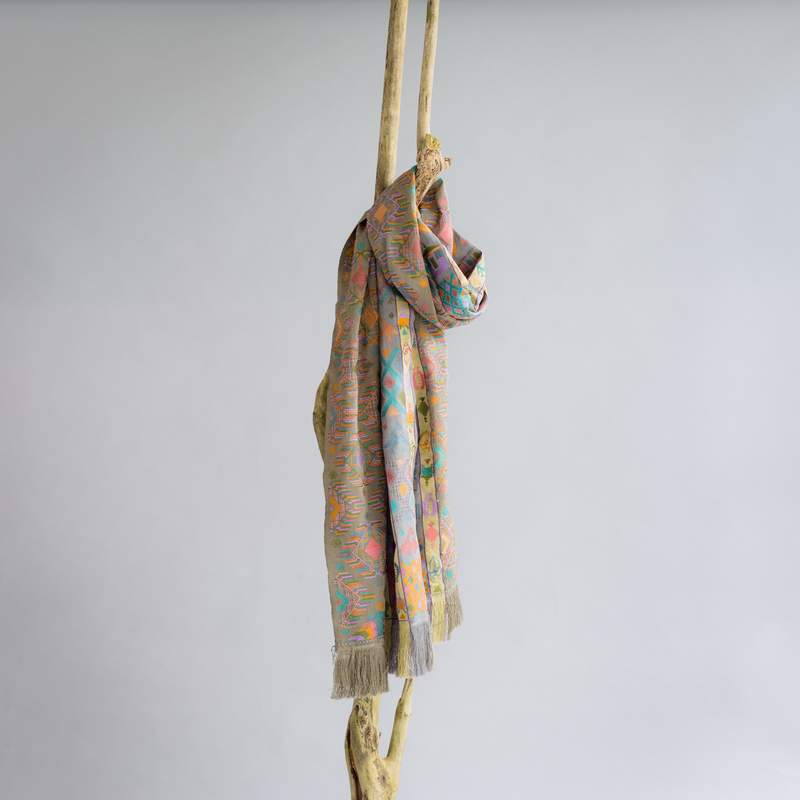 This one-of-a-kind silk wrap is handcrafted by master weaver Kelzang from Bhutan. The shawl originally is a panel from a kira, the traditional women's dress in the country. Bhutanese women wear kiras of this high quality only at very special occasions. What makes the wrap extra special is that it is covered with Buddhist symbols. Bhutan is a Buddhist Kingdom. Therefore you will find Buddhist symbols on many places in the country. However weaving these specific symbols in a kira is extremely difficult. Kelzang is one of the few high skilled master weavers in the country that masters this complicated technique. She worked every day for a period of six months to finalise this piece. 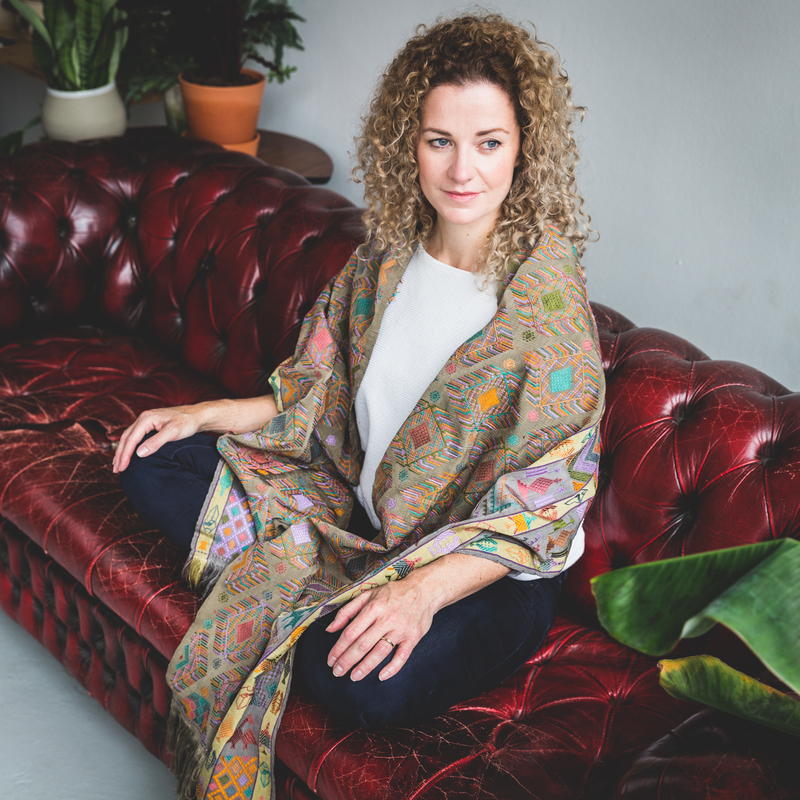 Please read our blog about Kelzang's Buddhist weaving if you are interested to learn more about the eight auspicious symbols that she wove into this wrap. Many women in Bhutan have learned their excellent weaving skills at a very young age from their mothers. Only few countries show such an amount of exquisite weaving, and still appreciate this form of high standard artisanry.